now reading: What is the Shape of an Atom's Nucleus? What is the Shape of an Atom's Nucleus? What do atoms look like? This is actually an impossible question to answer: Atoms are so tiny that we can't see them using light, even looking through the most powerful lenses and microscopes. The wavelength of light is as large as 4000-8000 hydrogen atoms placed side by side. Light is simply too big and too coarse of a brush with which to paint a picture of an atom. How can a study feel out the shape of an atom? Atoms are made of two main parts, and each part necessitates a different method. In the very center of the atom is the tiny nucleus, a dense cluster of protons and neutrons. The space surrounding this nuclear core is a group of electrons, known as the electron cloud. The latter dwarfs the former: if the nucleus were magnified to the size of a marble, the electron cloud would extend roughly a quarter of a mile in all directions from it. Methods to measure the electron cloud are complex subjects on their own; they involve firing other electrons at the atom (transmission electron microscopy, TEM) or using a tiny needle-point tip to poke at them (scanning tunneling microscopy, STM, and atomic force microscopy, AFM). While these microscopes can detect electrons, the nuclei are just too small for them to find. In the magnified atom analogy, this is like looking down from an airliner; you could see the atom's quarter-mile electron cloud, but certainly not the marble of the nucleus. This new experiment fired a beam of Ra-224 nuclei at a thin foil target of smaller atoms (nickel, cadmium and tin isotopes), and watched for high energy gamma rays blasted out of collisions between the nuclei and atoms in the target. (This technique is known as coulomb excitation.) Sensitive detectors set on all sides around the location of the collisions measure the direction and energy of these gamma rays. The energy and direction of a gamma ray produced in a particular collision depends on which specific quantum mechanical state transitions the Ra nucleus undergoes, as well as the shape of the nucleus. Observing many collisions, the relative frequency of different gamma rays with particular energies and directions are used to produce a model of the likely shape of the nucleus. The deduced shape of the Radium-224 nucleus is that of a pear. This is news to scientists; while pear-shaped nuclei had been predicted by mathematical models, no one had ever directly observed one before. All previously measured atomic nuclei had been either spherical or had the rugby ball-like ellipsoidal shape. The implications of this discovery stretch further. 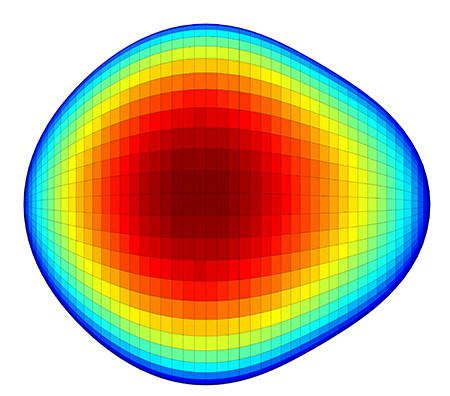 A pear-shaped nucleus might create something called an electric dipole moment in the atom. If both the nucleus and electron cloud are symmetric around the center of the atom, the centers of both positive and negative charge lie at exactly the same point. The new pear-shape might shift some protons to one side or the other, moving the positive charge center away from the negative, which creates an electric dipole with a particular electric dipole moment. Accompanying discussions in the same issue of Nature point out that this possible electric dipole moment result may tell us something about why there appears to be so much more matter than anti-matter in the universe, as well as help find limitations of the so-far resilient standard model of particle physics.